The “Havana” singer looks smashing in a pink sparkly Armani Privé dress surely borrowed straight from Elle Woods’s closet. The evening’s host starts her night in a sizzling red dress with a plunging neckline. 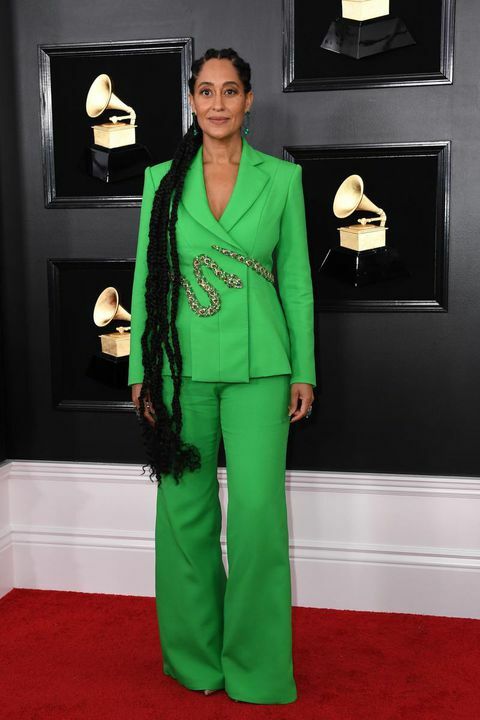 Hat tip to Janelle Monáe for never shying away from a fashion-forward look. Are we the only ones coveting the newlywed’s cropped flares for our work wardrobe? The sisters walk the red carpet looking like actual works of art in their coordinated sculptural pieces. Now that’s a pantsuit. We’re (snake) charmed by this glorious green number from Ralph & Russo. The Canadian songstress plays it sheer in a simple LBD. We’re getting babely rocker vibes from the eternal red-carpet star’s custom (new) Celine sparkler. The Best New Artist nominee shows up looking every bit a winner in tonal silvers with a mega train. The playful pop star looks cute as a cupcake in Balmain.